We had a very nice “catered” Christmas Dinner for our Dec. 6th meeting. We collected children's books for the Glastonbury Social Service Department and also non-perishable food items. The Town of Glastonbury is also raising funds for a K9 program..  At our meeting we voted to send a check of $100.00 in to the town for that program. 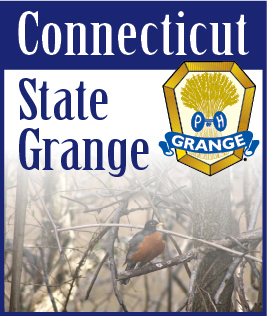 We also voted to send a contribution to the CT State Grange Foundation for the Love for Lillian program. In late November we presented Dictionaries to the 3rd grade class at the Nayaug Elementary School. We have received some nice “thank you” notes from the students. The following is one of them. “Dear Glastonbury Grange”,   I loved that you got us those dictionaries. I can not thank you enough for them. I would have never ever known about the longest word in the english language, or what the big words mean. I’ve never owned a dictionary until you came. Thanks again, sincerely  Hunter!! Another one -  Dear Glastonbury Grange   Thank you for the dictionary. I learned a lot of new words. I’m am completely addicted to the dictionary. I love my dictionary because they have the word   supercalifragilisticexpialidocious. Feb.16: Monti Carlo Whist  7:00 p.m.